This Battle was spurred by a heated Twitter exchange after Degree® named Curry a “game changer” in the NBA. Wall begged to differ and challenged Curry to battle it out on the court during All-Star weekend. Fans joined the conversation choosing #TeamWall or #TeamCurry, and Degree® Dry Spray gave fans the chance to vote on one of the shots in the competition. The Degree® Battle of The Game Changers took place during NBA All-Star Practice presented by Sean John at Macy’s. 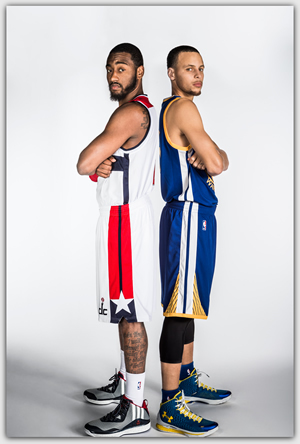 While Curry and Wall were announced to much fanfare, they were all business once the competition began. To start the Battle, Curry chose a seated jump shot, which both players’ narrowly missed. Next, Wall chose a bouncing shot from 15 feet out; Stephen and John’s shots both rimmed out. The third shot of the competition, a ‘Fan Shot’ that was decided by more than 9,000 votes, was a blindfolded free throw. The shot proved to be too much for the All-Stars, as they both missed their attempt, sending the Battle to the fourth and final shot, which would decide the champion of the Battle. To close out the competition and decide who was the ‘Ultimate Game Changer,’ actor, comedian and lifelong NBA fan, Michael Rapaport, stepped in to assist with the final shot. To the crowd’s delight, he chose the ‘Game Changer’ shot, a contested crossover jump shot from the top of the key. Rapaport checked into the challenge and defended both players as they hoisted their final attempt to win the Battle. Rapaport’s defense proved to be too much for Curry, as his shot was barely off the mark. With victory looming, Wall used his signature crossover dribble to shake Rapaport, sink the jump shot and win the Battle of the Game Changers title.